When I was a kid my cousins and I used to play restaurant in the basement of my Grandma Ebeling’s house. We had a jade green, plastic colander filled with strips of paper towel “noodles” which were carefully prepared in the bathroom sink by wetting them under the faucet to make sure they were cooked to a perfect al dente, and the chef would speak in a thick Italian accent while the “spaghetti” was served to the basement patrons. This was a rare treat saved for holidays, and one of my fondest memories of being with my cousins. As we got older the holiday visits were fewer and farther between, and far too many years had gone by since we were all together. This past summer my Aunt threw a family reunion on the East Coast, and it was an amazing week of reconnecting with family and sharing stories. One afternoon I spent a few hours going through old family photos and recipes with my Aunts. 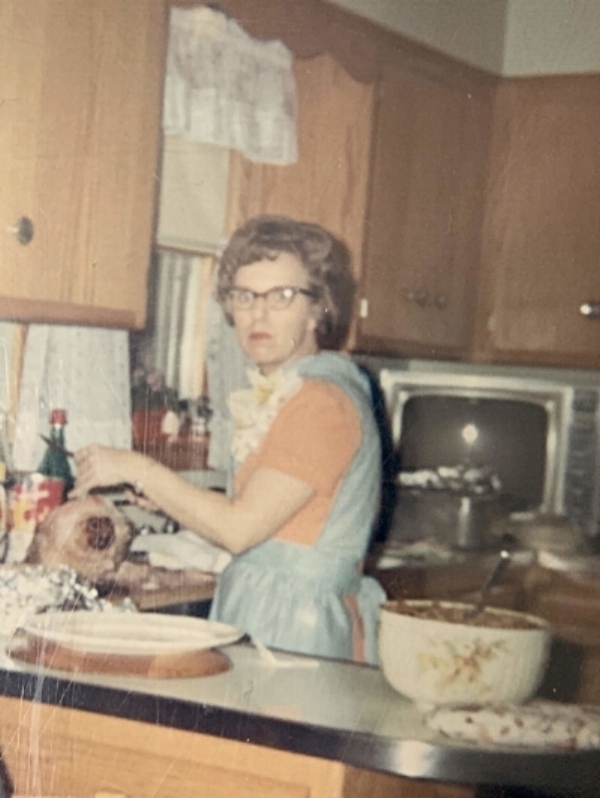 My Grandma Ebeling was a fantastic cook, known for her traditional Midwest suppers and delicious desserts. Her food was simple, comforting, and always made with love. One of the most memorable recipes was for her Rice Krispie cookies, a simple cookie with puffed rice cereal and walnuts, which was served at every holiday party and always a family favorite. These cookies hold a special place in my heart, and I hope they become a favorite for you and yours too. In a large bowl or stand mixer cream the butter and sugar until light and fluffy. Add vanilla , and mix until incorporated. In a small bowl whisk flour, baking soda, and baking powder together. Add dry ingredients to butter and sugar mixture, and mix until a dough forms. Stir in cereal and nuts by hand until evenly distributed throughout. This step will take some elbow grease, as the dough is soft, but stiff. Next, roll dough into balls (approximately 1 Tbsp of dough) and flatten with a wet fork on a cookie sheet. Bake for approximately 10-15 minutes, or until the edges just turn golden. Yields around 45-46 cookies.